Docsmartypants » Blog Archive » We have a PUPPY! 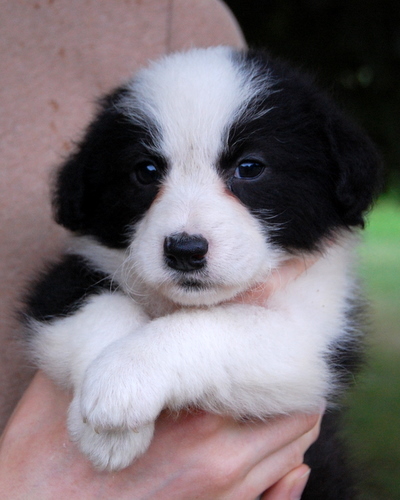 Larry and I have FINALLY found a puppy to join our little family! She’s a Corgi-Poodle mix (the poodle part is supposed to make her less hard on my allergies). 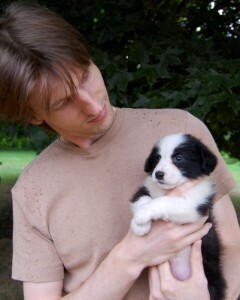 We picked her out today and will be bringing her home in early August since she’s still too young (five weeks old). Until we decide on her real name we’re calling her TK (an editing term used as a placeholder in text when you have information to add later). Here are a few photos of her! This is the cutest puppy ever! And she looks suspiciously like Cormac. Don’t you just want to rub that little tummy? We are so happy for you! She does look a lot like Cormac. It’s probably why I liked her best. She is perfect! I love her already! 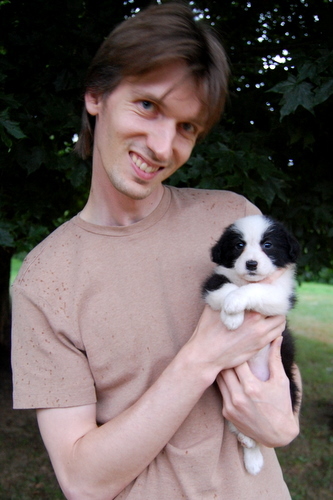 And I also cannot believe how much those puppies look like tiny Border Collies! You can tell how she’s a *lady* by the way she has her paws demurely crossed at the ankle. Thanks everyone! I know I’m going to be a little annoying for a bit with the “new mom” syndrome, but what can you do? How adorable! What fun you three will have! You didn’t mention the puppy when I talked with you yesterday! Oh! I assumed Larry had already told you all about her!